The Pas du Loup Hotel Club *** is located in the center of the Isola 2000 resort, in front of the slopes and at few meters from the ski lift. Connected to the shopping mall and to main shops (such as ski rental, bike rental, cash desk for the ski pass, discotheque), the establishment is ideally located to enjoy your stay in Isola 2000. For your high altitude stay, the Hotel offers 116 rooms all comfort with TV, private bathroom with bath, toilet and hair dryer, Wifi and Safe for free. The pets are allowed for free in the hotel, except in the restaurant and pool area. Unique in Isola 2000 : the Pas du Loup Hotel offers an All Inclusive service, which includes accommodation, unlimited drinks all the day and catering. During french school holidays, our animation team greets your children in our mini-club. 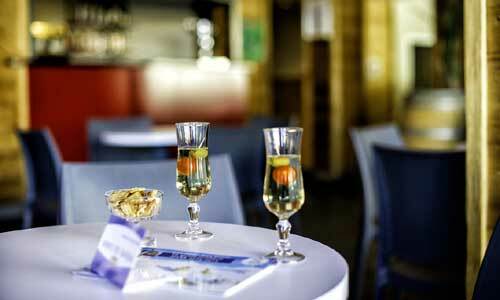 For the adults some activities such as lively evenings and « aperitif games » are organized. To stay connected to your friends and family, the Pas du Loup Hotel offers a free Wifi access. During the winter : Isola 2000 is the queen resort in the Southern Alps and in the Alpes Maritimes (06). The ski resort and the quality of the snow are always prepared to be sure you would enjoy your slide ! After such day, you will have the possibility to relax in our indoor pool and sauna* (with extra fees). There are many activities after ski such as snowmobile ride, sled dog or ice driving experience. Other prestigious events are planned such as Andros Trophy. During the summer : We come in Isola 2000 to enjoy pure air and the protected nature in the middle of the Mercantour Park. You can enjoy many rambles or bike ride. Moreover if you prefer to relax in an other away, the outside pool of Isola 2000 is waiting for you ! And for a change of surroundings you can go to the beaches in Nice and on the French Riviera, only 90 minutes away. When you book direct with soleilvacances.com ! Pay your stay at the last moment, the day of arrival. Free modification or cancellation up to 31 days before arrival. Let us know your preferences when booking ! We will do the best ! Direct booking has a lot of advantages ! Strengths of the hotel ! All rooms are equipped with a double bed or two single beds, bathroom with tub and toilet, SAT TV, Telephone, Hairdryer, Free safe, Wi-fi, Courtesy tray with espresso machine. – Double / Twin Superior rooms (18 m²) : + balcony facing ski slopes. – Room for 2 adults + 1 child under 12 y. (18 m²) : + 1 armchair bed. – Room 2 adults + 1 child under 12 y. 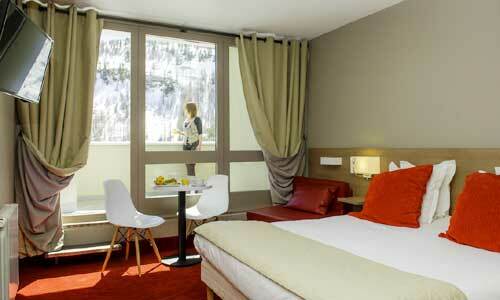 Superior (18 m²) : + 1 armchair bed balcony facing ski slopes. – Room 2 adults + 2 children under 12 y. (20 m²) : + 1 bunk bed. Cot and baby kit are free but on request only. Unique in Isola 2000, come to discover our All Inclusive ! The bar is opened all the day from 10.00 to 22.00 with cola, soda, syrups, spring water, juices, beer, wine, hot drinks (expresso and mineral water not included). From 12.00 to 13.30 and during the evening from 18.30 to 22.00 with kir, anis, whisky, gin, vodka, rhum, vermouth. Catering with hot breakfast / unlimited Brunch until 13.00 (packed lunch available during the winter and summer), Afternoon snack, Diner with themed buffet and wine included. For your "après ski" activities Pas du loup offers a small indoor pool (6m x 2.5m) with free access as well a sauna*. During the French school holidays, our children club welcomes "Pitchouns" from 4 to 11 years (4-8 years in winter), Monday to Friday, from 9 to 12 am and 14h-17h. All year, discover the adult and child entertainment program prepared by our animation team. Nearby : ski, winter sports, ski schools, snowmobiling, hiking, Aquavallée, summer outdoor pool, tennis, mini golf, mountain biking, mountaineering, cinema, pubs, clubs ... .